FAREWELL, ABRAM (Abraham), merchant, contractor, and politician; b. 21 Dec. 1812 at Harmony, Whitby Township, Upper Canada, the fifth child of Acheus Moody Farewell and Elizabeth Annis; m. 18 Jan. 1837 Caroline Stone; d. 8 Feb. 1888 at Oshawa, Ont. Abram Farewell received his early education at a local school in Whitby Township, and became an avid reader, particularly of political and constitutional works. He taught school in Whitby Township before joining his father’s mercantile and produce business at Harmony in 1830. Seven years later he built a large store there. The business prospered, and later he entered the grain export trade; he was also part-owner of several ships which carried grain to American ports. In 1852 Farewell was an incorporator and shareholder of the Oshawa Manufacturing Company, a large-scale maker of agricultural implements. Three years later he joined the syndicate of millers, including William Gamble and James Gooderham Worts, which founded the Bank of Toronto. 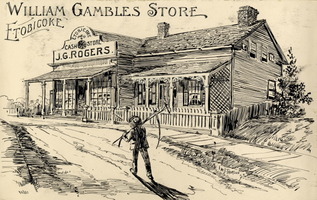 By 1860 he had sold his shares in the bank and owned instead 200 shares worth $8,000 in the Ontario Bank. The latter, chartered in 1857, was controlled by Montreal financiers such as John Starnes from the Montreal City and District Savings Bank. Farewell was an early advocate of the development of Ontario County through the construction of gravel roads and railways. In particular in the 1840s he advocated improving Simcoe Street by making it a toll-road so that the Oshawa–Harmony area would be better able to handle trade in grain and timber coming from Port Perry, the collection centre for the northern part of the county; Whitby had such an advantage with Port Perry because of a separate toll-road. In the 1850s he also predicted that unless a railway was built from Georgian Bay to Whitby, control of the inland grain and timber trade would be seized by Toronto and Port Hope interests. Although ridiculed at first by the ratepayers in Pickering and Whitby townships and Oshawa, who would have had to support the costly railway with their taxes, by 1867 Farewell’s ideas were being taken up in response to the impending construction of the Toronto and Nipissing Railway. 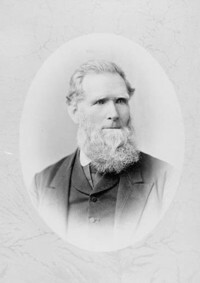 In 1868 he was one of the incorporators of the Port Whitby and Port Perry Railway Company; although construction was completed on 31 Aug. 1870 the line was too late to prevent the loss of trade funnelled to Toronto by the Toronto and Nipissing. In later life Farewell was a member of the contracting firm of Sifton, Ward and Company which built about 130 miles of the Canadian Pacific Railway track between Fort William (now part of Thunder Bay), Ont., and Selkirk, Man. Throughout his life, Farewell took an active part in local Reform politics. Although a “radical,” he had joined other Whitby Township Reformers in severing relations with William Lyon Mackenzie* over the constitutional issue in September 1837, and in December refused to follow Mackenzie in open rebellion. The next year, the steamer on which Farewell was making his semi-annual buying trip to Montreal was sunk by rebels in the canal at Beauharnois and he was held captive on the seigneury of Edward Ellice* for several weeks. This experience made him a lifelong enemy of Mackenzie and a strong advocate of constitutional methods to achieve political change. Farewell entered public life in 1843 when he was elected to the Home District Council; he remained in office until 1849. Although opposed to the separation for administrative purposes of Ontario County from York, which came about in 1851, because he feared higher taxes would be imposed, Farewell was elected to the Ontario County Council, and was deputy reeve for Whitby Township, in 1854, 1856, and 1857. He was also a perennial candidate for parliament, but enjoyed little success. Too radical a Clear Grit to receive support from the “practical” Reformers, he was usually defeated by “moderates” who could command both Reform and Conservative support. He was defeated in the riding of Ontario South by John M. Lumsden in 1854, and in 1857, when the constituency’s Reform association split between radical and moderate factions, Farewell withdrew in favour of Oliver Mowat* who was elected in 1858. In 1860 he contested King’s Division for the Legislative Council, but lost to David Reesor of Markham. When Mowat was appointed vice-chancellor of the Court of Chancery in Canada West in 1864, Farewell contested Ontario South on an anti-confederation platform, but was narrowly defeated in an extremely corrupt election by Thomas Nicholson Gibbs, who was supported by John A. Macdonald*. In 1871 Farewell finally won the provincial seat of Ontario South, defeating Dr William McGill, the sitting member; however, he lost to Nicholson William Brown, a Whitby industrialist, in 1875. Farewell was a member of the Disciples of Christ Church and was a strong supporter of all aspects of its work. Also actively involved in the temperance movement, in 1855 he toured several American states which had enacted prohibitory liquor laws and interviewed leading public figures concerning the results. His findings were published that year in a pamphlet written jointly with George P. Ure entitled The Maine law illustrated. Afterwards he campaigned on behalf of the Canadian Prohibitory Liquor Law League and as president was primarily responsible for the establishment of a number of temperance organizations in Ontario County. Abram Farewell was the author, with G. P. Ure, of The Maine law illustrated: being the result of an investigation made in the Maine law states (Toronto, 1855). AO, MU 2576, Scrapbook 11: 99. PAC, MG 24, B40, 7: 1620; MG 26, A. Globe, 16 Jan. 1857. North Ontario Observer and General Advertiser (Port Perry, [Ont. ]), 12 Dec. 1857, 20 June 1867, 9 March 1871, 31 Dec. 1874, 24 Feb. 1876. Oshawa Reformer (Oshawa, Ont. ), 22 Jan. 1875, 4 Oct. 1878, 13 Feb. 1880. Oshawa Vindicator (Oshawa), 28 Aug. 1867; 18 March 1869; 15, 22 March, 7 June 1871. Pickering News (Pickering, Ont. ), 13 April 1883. Whitby Chronicle (Whitby, Ont. ), 10 Dec. 1857, 20 June 1867, 13 April 1883. J. E. [C.] Farewell, County of Ontario; short notes as to the early settlement and progress of the county . . . (Belleville, Ont., 1973; first pub. with: Ontario County, By-laws of the council . . . (Whitby, 1907)). W. H. Higgins, The life and times of Joseph Gould . . . (Toronto, 1887; repr. Belleville, 1972). M. M. Hood, Oshawa . . . a history of “Canada’s motor city” (Oshawa, 1968). L. A. Johnson, History of the county of Ontario, 1615–1875 (Whitby, 1973), 142, 147, 187, 217, 237, 239, 241, 248. J. D. Ross, Education in Oshawa from settlement to city ([Oshawa? ], 1970). Leo A. Johnson, “FAREWELL, ABRAM,” in Dictionary of Canadian Biography, vol. 11, University of Toronto/Université Laval, 2003–, accessed April 22, 2019, http://www.biographi.ca/en/bio/farewell_abram_11E.html.